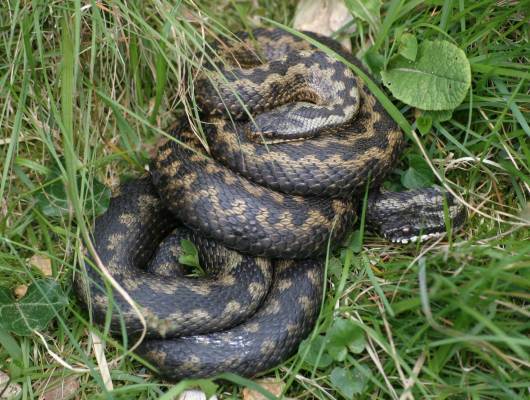 Adders are Britain's only venomous snake, but unless alarmed, cornered or handled they pose little threat to people. A full-grown adult Adder is typically 50 to 65 cm long, and occasionally females can grow to over a metre long; however, for the most part Adders are shorter and invariably much thicker than grass snakes. 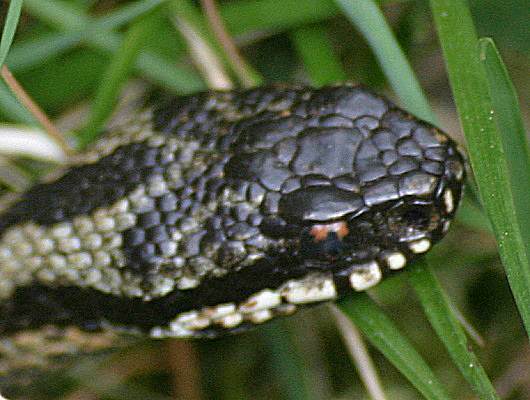 The grey-brown background colour of the Adder is quite different from the dark green of a Grass Snake, and yet many people have difficulty distinguishing the two. Adders have a dark zigzag running along the back and a dark Vee on the back of the head. The point of the Vee is between the eyes. The patterning and the background colour become duller just before the snake sheds (sloughs) a skin. European Adders - also known as Common Vipers - are found throughout Britain (but not Ireland) and are particularly common on heathland and on grassy cliff-tops and slopes, where they like to bask in open areas (including on footpaths). Unlike Grass Snakes, Adders do not like wet places. They are Britain's only venomous snakes, and although very poisonous an Adder's bite rarely proves fatal for an adult. Even so, if you go walking in Adder habitat it is advisable to wear stout footwear that will protect your ankles. On the European mainland their range extends from Scandinavia down to northern Italy and Greece, but they are absent from the Iberian Peninsula. This venomous snake has an eastern range extending through Russia and into Mongolia and northern China. Adders are viviparous. The eggs develop and hatch in the body of the female Adder. Typically ten baby Adders, 16 to 18cm long, are born in mid summer; they are able to reproduce when they are five years old. The life span of a European Adder is up to 15 years. Like other reptiles, they hibernate under the ground throughout the cold winter months, usually choosing the same place each year. The diet of Adders is very varied and includes voles and other small rodents, lizards, birds' eggs, insects and snails. They begin their hunting for food at dusk and are most active during the first few hours of darkness, travelling up to 100 metres from their lair (which is often the hole made by another animal). The Wildlife and Countryside Act provides very strict protection for this snake. If you come across an Adder you should not handle or even disturb it. Adders have several enemies including foxes, badgers and some of the larger owls.